we got up tuesday morning and did eat breakfast at a whataburger. i was able to try the honey-butter chicken biscuit, which is pretty good. while there, we learned two inmates had escaped the day before, killed one guard by hitting her and her horse with a pickup, and been loose for about 4 hours. interesting way to be introduced to a town. from whataburger we drove over to the cemetery where sam houston is buried. his current tombstone is pretty big, but his burial back in the day wasn’t very well attended and his original tombstone was rather ordinary. in fact, he didn’t enjoy much popularity in the last days of his life. he was buried in a pretty simple casket that was built by some union prisoners of war he had befriended. but he did some amazing things for the country and state of Texas. from there we headed over to the sam houston memorial museum. we started off watching a 20 minute movie in the building with the gift shop, walked the trail looking at his various houses and such, then went to main museum building. to tell just one thing: houston was unpopular late in life due to his lack of desire for Texas to secede from the u.s. because of this, he refused to take an oath of allegience to the confederacy, so he was removed from his office as governor of Texas. when he moved back to huntsville, he didn’t have a lot of money or clout. (and supposedly no one wanted to rent or sell him a house.) a guy had built a house for his son and daughter-in-law, but they wouldn’t live in it because of its odd design…evidently people made fun of it. it’s called the steamboat house, and it looks like…well, a steamboat (without a big paddle). it’d been sitting there vacant for a few years, so that’s where sam houston spent the very end of his life. they have the steamboat house on their grounds. overall, the museum has a pretty cool setup. sam houston was a very interesting character, so there’s plenty of stories to tell about him. they have some cool stuff that belonged to houston, including a few things he wore in pictures and paintings of him. * freemen of Texas to arms!!! to arms!!! after leaving the museum we drove up the street a little and stopped at a wendy’s to make plans. my parents decided they should probably go ahead and start heading back toward austin and brady. so we parted ways, and i headed back to houston. from there we headed to the george bush presidential library. the grounds are pretty nice, although they seemed to like curving roads and walkways in unnecessary ways. the museum was closed because they were redoing it, but we were able to watch the video (which i had a coughing fit in…yep, still ill although getting better). they also had the traveling white house exhibit. it’s a 1″ to 1′ scale model of the white house, including the east and west wings. which means it’s miniature, but it’s pretty big. the guy who made it updates it every time a new president comes in and changes things, so it’s got the right chandeliers, carpets, pictures, chairs, etc. there is a pretty amazing amount of detail, down to books, tvs, etc. they said when a new president comes in, it takes them three years to update and build all of the new stuff and settings. it’s pretty crazy, but it’s cool to see. the visual model also gave me a better understanding of where everything is in relation to everything else in the white house. from watching videos that are with it, i also learned the press room (west wing…you know, the room with the white house logo on the blue drapes where they give daily briefings) is built on top of a swimming pool fdr used. i mean, the floor is built on 2×4’s and plywood and there is still a (empty) pool underneath it. and there are a heck of a lot of ethernet cables running underneath there (for all of the reporters equipment and such). besides the white house model, they also had one of the presidential limos president bush had used during his years as president. from the library we drove and stopped at a mcdonald’s to plan our next step. we decided we would go to the messina hof winery for their tour, then head to huntsville. on the drive from the library to messina hof, while driving down university, i looked in my rearview mirror to see another old ford pickup coming up behind me. not just another one…the same model as mine. a black 1965 short-bed f-100 pickup. the guy pulled up next to me and when i looked over he gave me a big thumbs up and i smiled at him. i couldn’t tell if it was a v-8 or not. but it was sort of weird to see someone with the same thing. we got to messina hof and had some time before the next tour, so we decided to do a wine tasting. my dad and i paid $5 each and got to select four wines to sample. after doing that, we decided to go ahead and wait for the tour. at first we thought we were going to be the only ones, but within the first 15 minutes or so after it started about 6 other people had joined us. they gave us the history of the winery, then showed us around the villa and the winery. the villa is an inn/bed and breakfast they built. it looked like a pretty cool place for a couple to go. (something i’ll have to keep in mind, should i ever find myself in that situation again.) they also have a restaurant, but it wasn’t opened. the tour included another tasting, so we got to try four more wines. the guide also gave some info and tips on wines, how to sample them, how to inspect them, etc. it was informative, since i’ve never known much of anything about it. i still don’t like wine much, but what i did learn is that i prefer white or lighter wines (not dry though) to reds. and all these years i kept buying reds, convinced that’s what i should drink. although overall i prefer ports because they are sweeter. i ended up buying a bottle of sweet sangria and a bottle of muscat canelli. we also got a free glass with each tasting, so i have a pair of messina hof wine glasses. after that we hopped on the highway and headed to huntsville. we got into huntsville and checked into a motel 6, then we looked in the yellow pages for a place to eat. we ended up going to kaldi’s (their site plays classical music when you load it, so you might want to avoid it), a coffeehouse near sam houston state university that serves sandwiches, coffee, smoothies, etc. after eating i drove my parents down i-45 to show them the huge sam houston statue that was put up a few years ago. it’s close to white and has bright lights on it. when you’re driving up from houston toward hunstville, you can see it from miles away. it looks like it’s right in the middle of the road for several miles before you get to it. headed south on i-45, you just sort of suddenly stumble onto it on your left because it’s around a curve and mostly obscured by trees and hills. after seeing it in both directions, we headed back to the motel. sunday morning (the 23rd…a week ago) my parents got up to eat breakfast with the newlyweds and the new in-laws at 9am. i slept until 10:30am or so, since check out for “the out back” was 11am. i still felt pretty crappy, so i took some more dayquil. around 11am my parents returned, then we went over to heather’s parents’ house and hung out for awhile. linc and heather opened all of their wedding presents. i had some orange juice. my parents discussed just parting ways since i was feeling sick, but i figured since we were already together and in the area, we might as well go ahead and do some stuff. i needed to return the monkey suit to a men’s wearhouse to avoid late fees, so we decided we’d head to college station. they had originally wanted to do the blue bell tour, but i guess they don’t do it on sundays and we were leaving the area so that didn’t work out. another thing they’d mentioned that we could do was go by washington-on-the-brazos. if you don’t know your Texas history, look it up. we went to the information center and gift shop, then through the museum. i’d been there a couple of years ago with jennifer and her kids, but that was during a reenactment of the signing of the Texas declaration of independence so it was packed with people. (okay, i gave it away…but you should still look it up…history is interesting.) this time, there weren’t very many folk. the museum is pretty cool. it’s in the shape of a five-pointed star, and is two stories. you can learn a fair bit about the general history of Texas at it, as well as the way people lived, worked, etc. somewhere right around here, i rolled 63k on my ’65 pickup. we took off and headed to college station. i dropped my tux off and we checked into a motel 6. my parents were asking about a place i’d like to eat, but most of the places i could think of i used to eat are either gone or were generic chains that aren’t interesting to eat at when you’re visiting somewhere. they ended up stopping at a chili’s. (ah, defeat.) we went back to the motel room so my dad could watch the cowboys play. that was the end of day one. we went to the bt longhorn saloon. the saloon has a really cool, big wooden bar. i didn’t drink. we ate lunch and linc gave us our gifts. they were invicta chrome mechanical skeleton pocket watches. a very cool gift. after lunch we headed back to heather’s parents’ house and went upstairs where they have a pool table, pinball machine, darts, etc. we hung out there for an hour or two, then started to take off to get ready for the wedding. once there, i hung out with linc and my parents and the groomsmen, and eventually had a bunch of pictures taken with me. (not something i enjoy.) at this point my brother and i also got to meet one of my mother’s half-sisters (blood related), who had come to the wedding. (i didn’t actually see or talk to her much after that.) and i sucked down some more dayquil. and someone brought over some smaller cups of the frozen margaritas for the reception so i had one of those. the wedding party got ready and we all walked over to the chapel. it was a bit hot at 6pm in a tux, but not horrible. the ceremony went off well. the only abnormality i recall is when heather’s mom lit her family candle and walked away, it looked like it had fallen over. what actually happened was the wax was so soft it slumped over onto the unity candle. after my parents lit their candle, it did the same thing. we were all noticing it and laughing, somewhat humorously and somewhat alarmed that the chapel might start on fire. when the judge (who was performing the ceremony for them) got to the point where linc and heather were supposed to go light the unity candle, everyone sort of laughed. then the judge made a joke about unexpected things needing to happen at weddings, but then said she thought it was actually neat because it represented a more real combining of families with the candles touching and melting onto the unity candle. (fast thinking on her feet.) the ceremony ended and everyone headed over to the pavilion right beside the chapel for the reception. when we were walking back down the aisle, i noticed the potts’ had shown up. the reception music was pretty much picked by my brother, so it was a combination of old country, old blues, dylan, Texas swing, etc. later in the evening some funk and more modern stuff started showing up. the groom’s cake was a rectangular white icing cake. (perhaps carrot cake with cream cheese icing? i only had a few bites, but it tasted very good.) on top were some musical notes in icing and propped up cd-size copies of three album covers: johnny cash, dylan, and lightnin’ hopkins. (i don’t recall which specific albums they were.) the wedding cake was also white, but about four or five round stacked layers. it had butterflies on it. (this makes more sense if you know that “mariposa” means “butterfly” in spanish.) i think it was white cake with a strawberry glaze inside…i didn’t actually have any of it. i walked around for some of the reception, then sat at a table with the potts’ and drank punch and eventually got a little bit of food, talked with two couples who’d driven from brady for the wedding (friends of the family), and then decided i couldn’t really take it any more. i did see the first dance, the father-daughter dance, and the mother-son dance. but the combination of a large crowd and lots of motion and mingling, my being sick, and the fact that weddings still cause me to get emotional about my own life, led me to strike off more permanently for awhile. i didn’t really feel it would be right for me to leave though, as it was my brother’s wedding, but i didn’t really feel like being surrounded by a bunch of people, feeling bad physically and emotionally. i think the straw was when “silver wings” started playing. i struck off for my pickup, which was parked 100 yards or so away from the pavilion near a house, dropped the tailgate, and laid down on it, looking up at the sky and the stars. after about maybe 30 minutes or something, my dad showed up and started talking with me. he said he thought maybe i’d left, and that i could go if i felt bad. i said i felt like i should stay, and he said “i’d go if i could, but your mom wants to stay.” we talked for awhile, and i explained i was over there more than just because i was sick. (i think he already knew that, but i went through it anyway.) to give an example, i mentioned my strong emotional ties to the song “waltz across Texas” and the meaning and emotion i’ve attached to it in my mind (i love the sentiment, and would love to be able to dance with someone i felt it for, especially at my reception if i ever get married again), and said i probably would have had to walk away immediately if they’d played it at some point. then a mere minute or two later, “waltz across Texas” started playing. i think my brother, dad, and i all have some of that same tendency to want to avoid large crowds and big social gatherings. although it shows up in different ways and at different levels for each of us. anyway, eventually my brother wandered over. earlier in the day i’d mentioned to him i’d brought some cigars, so he and i smoked cigars for awhile (my dad deferred) and we all talked some, then linc said he should probably get back to the reception. i’m glad my dad, my brother, and i were able to just hang out alone for a little while. a little later my mom came over and we all talked some, then my mom and dad called it a night. after a while, sue showed up looking for jack. i’d seen him head into the house with most of their kids, so i let her know, then he eventually came by. we all talked for awhile, then they took off back to houston. i tried to collect some internal energy and headed back to the reception. by this point, a lot of the people at the reception had started leaving. my brother was surprised to see me again, as he’d figured i left when our parents did. it was originally supposed to go until around midnight, but linc and heather decided to go ahead and depart early so there’d still be a decent enough crowd around. we saw them off, then pretty much everyone dispersed. the dj kept playing, even when the only people left were the family and people cleaning up for the night. i still felt pretty awkward, just sort of standing around and not talking to anyone. (it’s what i tend to do…i don’t initiate conversation usually or jump into the middle of ongoing ones. but if someone starts to talk to me, i’m generally more than happy to converse.) eventually josh (one of the groomsmen) said a few of them were going to head over to the pool and sit there and talk. i wavered for awhile on whether i could handle any more awkward social moments, but eventually decided to go with them. it turned out to be all the groomsmen and beverly (who shot the wedding, and is jim’s wife). we sat on lounge chairs and talked for awhile, until most all of the lights were off and everyone else was gone. as we were parting, i mentioned to jim he’d said i could give him my resume a couple of years ago since i’d like to live in austin but i don’t have any contacts there in the field i work in. he remembered and he gave me some contact info and told me he could pass it on because he works with people who do the kind of stuff i do. getting around the hr department is really the best possible path for finding a job, so if my resume can get directly in the hands of a systems department that’s good. i’ll have to get around to actually sending him my resume this time. i’m in no rush to find a new job at this point, but if something good in austin ever popped up, i’d be happy to be there. i walked back mostly in the dark through the empty pavilion and back to my pickup, then headed back to “the out back” and went directly to sleep. he hand-printed a limited run of 45 and they gave them to wedding party people and family. (the picture above is of mine.) he was at the wedding, and i know he got a lot of comments from various people about the poster. by the way, jaime is the same guy who did the red and black hand-printed johnny cash poster i have framed and in my living room. you know, at this point i don’t remember much about the earlier part of last week. i ended up buying the second palm/directors label the work of directors box set with the border’s coupon. (i already have the first one.) this one has a dvd and book for stephane sednaoui, anton corbijn, jonathan glazer, and mark romanek (he did the johnny cash “hurt” video…*swoon*…which is on this dvd). what i should have bought instead was the 3-disc criterion edition of brasil. i didn’t realize the criterion version i have is so much less. one day (tuesday? thursday?) i went over to the potts’ and ate supper with them and watched word wars. it’s a documentary about tournament scrabble players. it’s an interesting peek into the lives of some intelligent and/or eclectic folk. the movie is rather aware it is making jokes or poking fun at some of the participants, but at the same time you also end up understanding them better and hoping for the best for them. or at least i did. i also determined i don’t really want to invest the energy in becoming a “serious” scrabble player. i’d rather know what a word means and not know how to spell it than know how to spell lots of words but not really know what they mean (or have the only reason for knowing them be their odd letters or small size). if anything else happened before my extended weekend, i appear to have forgotten it. i took friday, monday, and tuesday off of work. the occasion? my brother was getting married on the 22nd in brenham. i spent a couple of days in brenham for the wedding, then spent a couple of days with my parents. unfortunately, i started feeling sick and was ill with a head cold/fever for pretty much the whole time i was away from work. i started popping vitamin c and zinc lozenges after i got up friday morning, hoping it would take the edge off or (preferably) stop any impending illness. it didn’t. (well, maybe it did, but i was still felt pretty bad a few days.) but i was pretty much back to normal by the day i came back to work (wednesday). how is it exactly that’s the way things work out? thursday i went by men’s wearhouse and tried on my tux. the pants were a little too long, so they told me to come back by on friday around noon. i went back by on friday and picked the tux up. it was more traditional than i’d been expecting. linc had been looking at some western-ish tuxes, but in the end went with a conservative traditional black tux, silver and grey vest and tie, and a white shirt. i had originally thought i might ride the motorcycle up there, but in the end i decided to go with the truck because i needed a way to reasonably transport the wedding gifts, my clothes for the weekend, and the tux. as for the gifts: one was a mixer/blender in a decently big box, and the other was a cannister set in a box almost as big and a lot heavier. getting that stuff on a motorcycle didn’t really seem practical. i left houston around 2pm, and even though i figured that’d mean smooth sailing i spent half an hour to an hour in slow traffic on 290 headed out. bleh. after being there a bit, i went with my parents over to heather’s (the bride) parents’ house to help set up for the rehearsal dinner. my parents had conveniently chosen a place to stay that was right across the (rural, dirt) road from heather’s parents. i met heather’s parents and some of her family, helped do a little setup stuff, and sat around. my mom convinced me to go ahead and take my gifts over to the house instead of leaving them where we were staying. linc and heather showed up, and i hung out there awhile, then we went to the rehearsal. 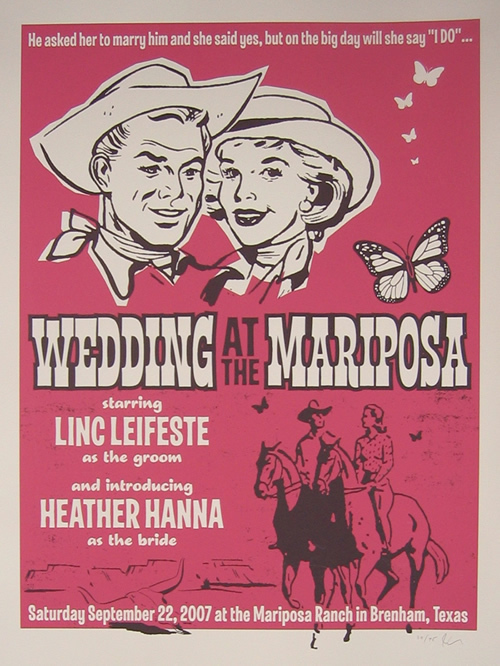 the wedding was taking place at the mariposa ranch, a few miles outside of brenham. (and only a couple of miles from heather’s parents’ place.) the mariposa is a bed and breakfast place, but they also have a big pavilion and a glass and wood outdoor open chapel. i met the various people who were going to be in the wedding, linc’s other groomsmen all being people i’ve met and known somewhat over the years. the rehearsal went fine, then we went back to heather’s parents’ house for the dinner. they had bbq and sides, homemade blackberry and peach cobblers, imperial cane sugar dr. pepper, etc. they also had some tecate and wine, but i didn’t feel like drinking. someone decided linc and heather should go ahead and open the few wedding presents already there, so they did. i had them open the blender first, since it’s a higher dollar item than the cannister set. but what i’d added to the cannister set made it worth a lot more, and made it very heavy. everyone who had picked it up was commenting on how heavy it was, and there was plenty of speculation about what it could be. not knowing i’d be there for them to open it, i’d also made sure and added a note to it to make sure they opened it all up. (i had a bit of fear they’d return it or something, not knowing what was inside…although i think that was unfounded considering how oddly heavy it was.) i had also made the additions so that more showed up with each cannister they opened. so what did i add? $1 coins. a lot of $1 coins. everyone seemed to be impressed by the creative gift giving. i felt a bit self-conscious about it, since i hadn’t really planned for the whole wedding party and family to be there when they opened it. nevertheless, i think it went over well and they were pleasantly surprised, so i felt good about my method of delivery. my illness was also getting worse, so it sort of heightened my normal lack of social outgoingness, but i stuck things out and left with my parents fairly late. i’m not dead. yet. i’ve just been away from internet access since friday afternoon, and cell usage since saturday night. i will provide highlights of my time away as i feel compelled. which will hopefully be this evening/night and/or over the next day or two. i will mention now i had over 850 messages waiting for me in one of my inboxes when i returned, only 16 of which weren’t spam. (although most of the 16 were bulk email.) that’s over 200 spam messages per day. i know others have it worse (there are some accounts at work i admin/use that get it worse), but that’s a lot of hitting the “delete” button per day. still, having the same email address since 1998 is nice. friday i got to go in late to work, but i met some co-workers at niko niko’s for lunch. on the way back, i learned a valuable lesson about the difference between my new vans and the types of shoes i’ve generally worn for the last 10+ years. the soles are much softer, and the shoe is more pliable in general. how did i learn this? on my motorcycle, pushing on the rear (foot) brake while in a turn. instead of pushing the foot pedal like normal, the soft shoe just sort of squished around it and bent. this led me to go faster than intended, which caused my momentum to push me further out, which led me to pop the underside of my bike on the curb. oops. well, at least i didn’t go flying, and the fairly small amount of damage is not visible unless you’re looking under the bike. as we were leaving work, chris let me know that serenity was showing as the midnight movie at the river oaks. i’ve been planning on seeing it at some point, so figured “why not on the big screen?” i contacted a few people, and kymberlie and lemaster ended up joining me. i think most of the people had already seen it. it was pretty good, but nothing spectacular. i’m not a huge fan of sci-fi television (star trek, babylon 5, whatever else), but i’ll probably give the “firefly” series a try when/if someone gives me the dvds to borrow. saturday for lunch i went and ate at the new jenni’s noodle house location. good stuff. i’ll probably be going there more often now that it’s nearer to me. i also managed to go by and pick up wedding present(s) for my brother and heather. in the evening i was planning on going to see the gore gore girls and reverend horton heat at the meridian, but those plans ended up falling apart so i ended up going down to sugarland with the potts clan to see the free outdoor showing of night at the museum. we got there late, it was distracting, and we walked around quite a bit, so i can’t really say i watched much of the movie. what i did see seemed adequately funny in a family comedy sort of way. afterward i went back to the potts’ house and watched saturday night live with them. sunday i skipped church. i think this is the first time i’ve knowingly blown off church since i’ve been going regularly. it’s something that’s been sort of brewing for awhile, but after last sunday i just sort of admitted defeat. ah well. i’m still going to defer talking about it. one of these days i’ll get around to it. then i spent around 7.5 hours watching roller derby. the governor’s cup was held in houston this year. it is a tournament between various roller derby leagues from around the state. it was a good time, but it was a lot of roller derby in one sitting. a couple of the games were blow-outs, so they weren’t too exciting. still, being able to sit and watch a lot of mostly alt girls in roller derby outfits knock each other around is a good way to pass the time. those girls have to have some pretty good endurance to be going around the track that many times for that long, knocking each other around, and still have energy to spare. i came home and decided to watch the deer hunter. which is a good movie, but not necessarily a good idea to start at 10:30pm or so when you’ve got work the next day. i think it clocked in at over 3 hours, and i was getting pretty tired. i don’t think it was amazing…but it was good. i would think a lot of people would find it to be an intolerably slow movie. it spent a whole lot of time just sort of following the characters around the town they were from. and they sang a lot of songs. but i personally didn’t end up feeling too emotionally attached to them. i couldn’t really place the movie in the context of when it came out, so i might be missing some aspects of what made it so well known because of that. i did think de niro’s character was interesting. tonight i went to border’s because i have a 40% off any dvd box set coupon, but nothing really stuck out to me as something i had to have. i guess i’ll try again tomorrow, since that’s when the coupon ends. as i mentioned previously, both of my pairs of vans i ordered online came in. i’m now thinking maybe i should have ordered size 10 instead of 9.5. the 9.5 fit, but they feel a little tight. maybe they’ll stretch some as i wear them. we shall see. i didn’t mention it, but a few days ago i placed an order from rpb industries out of georgia. they sell masterpiece arms guns and accessories (among other things). i received my order today. ordered on the 9th, shipped on the 11th, got it today (13th) — that’s pretty sweet. i ordered 3 sten magazines, a mag loader for them, and a muzzle brake. (all for my mpa930, the mac mini 9mm.) i had purchased a used sten magazine at a gun show, but it seemed loose in my mac so i decided to just buy some new ones. after having loaded the previous ones several times, i also determined a mag loader would be really nice. the muzzle brake — i just thought it looked cool, and it’ll be interesting to see what affect it has on noise level, accuracy, etc. i also recently ran across the phenomenon of parkour in a couple of places. not really related, but i thought i’d mention it because it’s interesting. center where the laundromat is. i just went to www.noodlesrule.com (that’s jenni’s website) and checked it out. it is a second store, not a move. the good thing is the new one — unlike the original — is open on saturdays and they’re open 11am-10pm instead of 11am-3pm. rock! yesterday afternoon at work my manager called to let us know we could leave early if we needed to take care of some business before the tropical storm hit. the tropical storm? that’s right, humberto had stealthily appeared at our southern border out of almost nowhere. with supposedly sustained winds of 25-30 miles per hour and gusts up to 50 or 60 mph possible, a co-worker and i immediately knew there was only one option — road trip! we hopped in his rx-8 and headed toward the coast. we decided to take 288 down to freeport, then ride the coast up galveston island back to 45.
we did see several local news trucks down along the seawall near the landmark hotel. i think they picked it for the same reason we stopped there — it was one of the few places that had lights out over the water, so you could see the water hitting the pylons and the rain blowing around the building in the wind. and the occasional body boarder walking by to go down into the water. heh. i did of course miss part of the radio show to participate in this event. but jay, ever the gracious taskmaster, saw the hard-hitting, fact-finding, award-worthy investigative journalism that was bound to come out of this pursuit so he allowed me to skip. i called into the show to give a live humberto 2007 update, and actually made it back into houston in time to show up for the last 30 minutes or so of the show. i’m glad i did it, but hopefully next time there’ll be more to see. (where ever i’m heading next time probably won’t have the same hope.) it looks like — as with rita — beaumont and the Texas-louisiana border saw more action overnight than we did. fortunately for me, the main complainer about my snarky comments about rita no longer lives in the area so i shouldn’t have to deal with any of his “anonymous” sniping this time around.